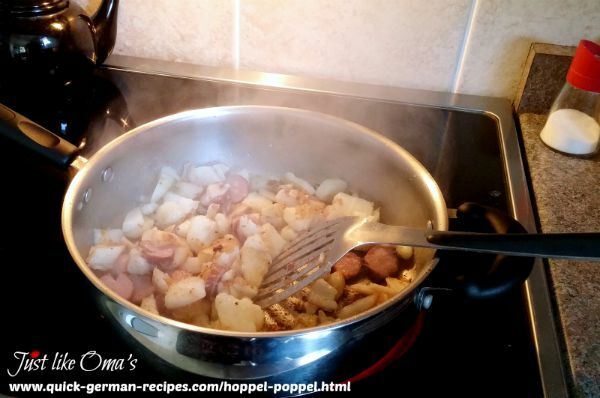 Hoppel Poppel is a traditional way to use up leftovers in Berlin. Made with meat, potatoes, onions, and eggs, it's one of those great quick recipes for supper or lunch. 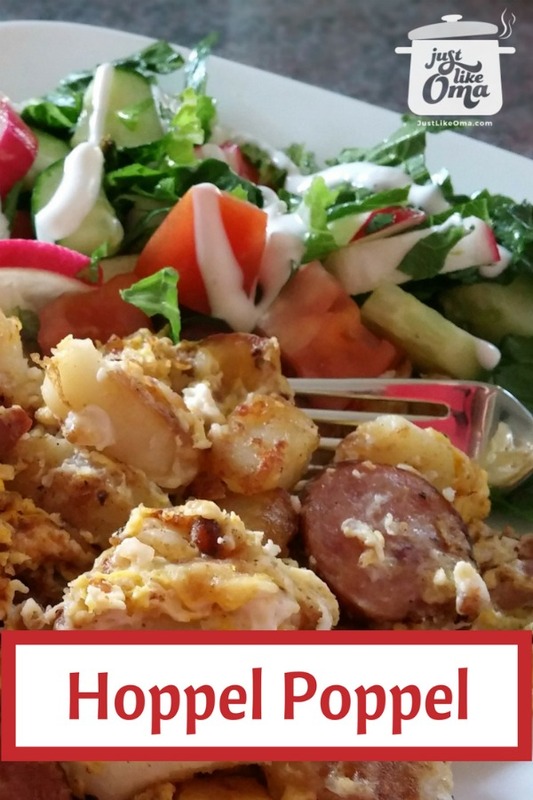 It's one of my favorite recipes using potatoes that I remember from Mutti. And yes, this is very similar to the traditional Bauernfrühstück ... a farmer's breakfast. It was so nice coming home for lunch on school days to find this on the table. We had a long walk, including a huge hill to climb, and this gave us energy to finish off the school day. Fry the onions in 2 Tbsp butter or oil. Once translucent, add the meat that has been thinly cut into strips. Add remaining 2 Tbsp butter or oil and the potatoes. Continue frying till potatoes are golden brown. Mix the eggs and pour over the meat and potatoes. Carefully stir until eggs are set. Use boiled or roasted beef, pork, chicken, hamburgers, lamb - whatever you have. Quick and easy to make, yet never quite the same as the last time. It all depended on what type of leftover meat Mom used. However, the meat is not required. The eggs provide enough protein, so if that's all there is, that's OK! Sometimes, instead of using the eggs, Mom would put leftover gravy over the potatoes and continue frying till everything was hot. When I now make this, my favourite to include is leftover Flatladen or Rouladen gravy. In fact, sometimes I'd make sure I had cooked extra potatoes just to be able to make this the next day. If you want, you can always fry up some bacon with the onions and not bother adding any other type of meat. This really is a recipe where "a bit of this and a bit of that" works so well. Use your imagination and create your own version. This recipe is a variation of various fried potato recipes also known as Bratkartoffeln in German. "Wine produces mockers; alcohol leads to brawls. Those led astray by drink cannot be wise."